Ecuador is emerging more and more as one of the top investment destinations in Latin America. The region has an incredible variety of natural resources, a notoriously hardworking and qualified workforce and a government which has made its position very clear in where it stands regarding foreign investment and has opened its arms to more foreign businesses settling on its shores. Ecuador is experiencing an unprecedented period of commercial success. The economy has successfully been stabilised and according to figures provided by the International Monetary Fund, the Ecuadorian economy is projected to grow at a rate of 2.5% in 2018, and continue its positive trajectory in coming years. The Law for Productive Development (Ley de Fomento Productivo), a piece of legislation passed in 2018 which has facilitated market entry and commercial operation for FDI, has been a message of conviction from the Ecuadorian government of its genuine intention to open itself up to the world and encourage more foreign businesses to nestle in the country. The law has provided income tax benefits during the first 15 years of a new company’s presence in the country, among many other attractive propositions. As a result of such a positive business environment, it would appear that the decision to invest in Ecuador is a given. To maximise profitability in the country, aligning yourself with a local partner who can take on some of the corporate and administrative load is crucial to your success. This partner will help you to navigate the often complicated regulatory norms in Ecuador, and will save you precious time and resources, and will allow you to focus on growing your core business. Keep reading this article to learn about all the Ecuadorian regulations that foreign companies must comply with and to learn more about how a local partner can help you to comply with local legislation! What are the legal requirements that companies must comply with in Ecuador? Starting up a new company is never easy. There are always a variety of obstacles and there are always high aspirations and weighty responsibilities such as the challenges of managing a team, satisfying company growth targets, meeting legal, company and regulatory requirements in a new country. All of this can be a real headache in the initial phases of starting a new business in Ecuador. The next part of this article will walk you through the nature of the requirements of starting a company in Ecuador for a variety of industries and company structures. Corporate Obligations for Companies in Ecuador. 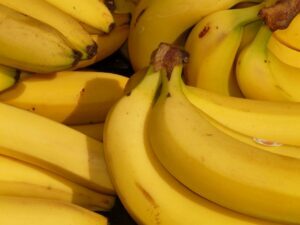 Ecuador produces an estimated 8 million tons of bananas annually. Companies that are incorporated in Ecuador, both LLC (Limited Liability Companies) and Anonymous Societies/Corporations, must have a minimum of 2 legal representatives. Normally, the General Manager and President of the company assume this role. Both must be Ecuadorian nationals or foreigners with a permanent resident visa. Normally one will take the lead as legal representative whilst the other will assume a ‘back-up’ position. Legally, however, they hold the same role. This role can be filled by natural and legal persons. Furthermore, these countries must register a fiscal address in Ecuador. Companies must register and maintain a dialogue with the Company Economic Information Superintendence, declaring information such as the company’s general balances, profit and loss statements and an updated list of the company’s shareholders. Companies also must share personal information with their administrators and their new appointments. Finally, companies must share the company address and the name of the general accountant who handles all financial activity for the company. In terms of company administration, all companies must have at least one Annual General Meeting ‘AGM’ within the first 3 months of the year to discuss who will be the shareholders and approve accounts, general balances of the country and organise the distribution of shares. The act which establishes this meeting can be found here. In the case of domiciled branches of foreign companies, they must have an attorney who is a resident of Ecuador and has full powers to fulfil obligations and respond to any government requests. The AGMs must satisfy various formalities which only a local partner can fulfil. Furthermore, it must be a person who can fully carry out the roles of local representation. Utilising the service of a local agent is a great alleviation of stress and can really allow managers to focus on their company vision. What are the Tributary Requirements for Ecuadorian Companies? There are two levels of Ecuadorian authority that you will need to pay taxes to, the Central Government and the municipal bodies. The former requires payments based on the company’s commercial activity, for example, VAT, income tax and the Tax on the Remittance of Currencies. The municipalities in Ecuador normally charge for the usage of territory and occasionally for some sorts of assets. As in any country, payment of tax is one of the most important requirements in the law and has some of the most punitive consequences in the case of noncompliance. There are many types of taxes, including many specifically Ecuadorian requirements such as the Environmental or Health taxes. The next section will explore the most important taxes that are normally paid by all companies. This is the tax which levies total income for natural persons, companies and undivided societies that draw profit from within Ecuadorian borders in any form; cash, salary or services, or any income gained from natural persons or domiciled societies in the country. All costs that help generate, maintain or increase income will be deductible. The assistance of a local tributary expert will be key to optimising your resources and for legally reducing tax payments. Currently, all companies have an income tax rate of 22%. VAT in Ecuador is amongst the lowest in the region, at just 12%, and is a very attractive reason to choose the country for many investors. This tax is added to the worth of any transfer of property, the importation of goods, any stage of commercialisation, copyrights, industrial property etc. This is a very common tax that works in a similar way to its equivalents across Latin America and Europe. The key to this payment and to a good management of this tax is in truly understanding what transactions require this tax and in balancing the amount you charge and pay. TOP TIP: There are many cases where foreign investors operating in Ecuador can be made exempt from certain taxes. This tax is not applied directly to companies, but rather to transfers, transport or the sending of money outside of Ecuador. Any flow of money that exceeds the minimum threshold must pay a charge of 5%. 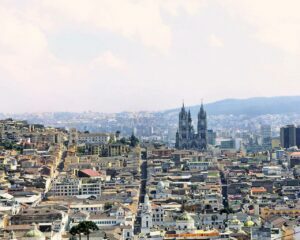 The beautiful Ecuadorian capital, Quito. In addition to the normal taxes that municipalities may charge for things like plumbing and rubbish collection, municipalities often charge a property tax which is based on the registered value of the property. Most municipalities charge at a rate of 1.5 x 1000 of the shares that the company possesses. What are the Working Obligations for Ecuadorian Companies? Not complying with the working obligations in Ecuador can have quite severe consequences. It is one of the main reasons that allying with a local expert can be crucial. One of the most important obligations is to register all workers to the Ecuadorian Social Security Institute (IESS). In the case of new companies, this will include obtaining your username and password for the server. The cost of registration is shared between the employer and the employee. The employer will pay 11.15% and the employee pays 9.45% of the salary towards IESS. It is very important to pay all payroll contributions on time as there will be heavy sanctions for late payment. Furthermore, companies need to register all workers online with the Labour Ministry. Employers must be sure to comply with the internal structure of the Labour Ministry in identical fashion to the Ecuadorian Social Security Institute. Do you need corporate secretarial services in Ecuador? Now is undoubtedly the ideal moment to invest in establishing a company in Ecuador. However, the number of complicated and varied obligations that must be followed in Ecuador to satisfy all of the different authorities means that the whole process can be slightly complicated at the best of times. For this reason, hiring the services of a corporate expert in Ecuador can be a key step to experience commercial success in the region. If you wish to know more about our provision of market-entry and back-office services, including corporate secretarial services in Ecuador, please get in touch with our Country Manager, Ernesto via [email protected] and see how we can support you and your business in Ecuador.